The latest figures from market analysts Canalys have quantified a trend that many of us might have sensed in 2018: the rise of the Chinese phone in Europe. The year saw huge flagship launch events in Paris hosted by Huawei and Oppo, accompanied by Xiaomi’s gradual expansion into more countries across the continent and OnePlus’ enduring popularity. 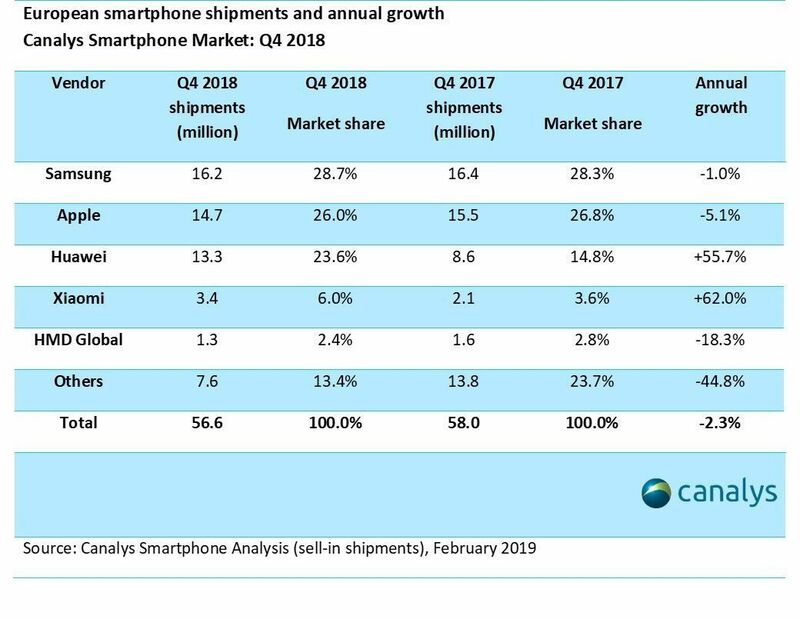 Canalys says that 32 percent, or roughly one-third, of smartphone shipments in Europe in 2018 were from Chinese manufacturers, with Huawei taking the lion’s share of that with more than 23 percent of the overall market in the final months of the year. With a smartphone market that’s shrinking globally — as well as within Western, but not Eastern, Europe — there are bound to be bigger losers than winners. In 2018, the largest drop came in the number of phones shipped by market leader Samsung, which was down more than 10 percent relative to 2017. Apple also didn’t fare brilliantly, recording an annual drop of 6 percent. By Canalys’ estimates, Apple finished the year with 42.8 million iPhones shipped in Europe, a sliver above Huawei’s 42.5 million devices. If these trends continue, Huawei is likely to secure the second spot behind Samsung in Europe early this year and hold on to it at least until the next iPhone refresh in September. Despite — and to some extent, perhaps because of the United States’ current antipathy to Huawei and other Chinese brands — China’s smartphone leaders are finding great success elsewhere.